An engrossing tale of revenge, malice, pride and the corruption of love. I was unexpectedly entranced by this classic novel that I had avoided for so many years, especially as it so thoroughly scuppered all of my pre-conceived notions about the plot. This is not a romantic tale of love and lust with a happily-ever-after, it is a bitter and twisted story of all the worst ways humans can corrupt emotions. And I loved it. I found all the characters in Wuthering Heights to be wicked or contemptible in some way. Even Nelly, the sometimes narrator and maid, who could have been portrayed as a kindly, sympathetic character is responsible for treating other characters awfully. To me though this was all part of the appeal! It sounds strange to enjoy a book so much where you can’t possibly like a single character, but there is something so wonderfully invigorating about reading a novel where the author has so deliberately set out to expose all the worse parts of humanity. I feel like many people will be torn between hatred of the characters and being impressed with the literary merit of the story. For me, I don’t mind that all of the characters are awful, I think it just shows a writer who was so determined to write either what she saw of the world, or what she saw that was missing from novels in her time. By the end though I came to be sympathetic towards Hareton, so I guess he is the redemption of the novel. 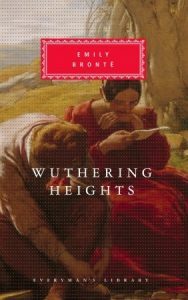 One of the most fascinating elements of Wuthering Heights is the connections between everything in the story. There are pairs everywhere you look, and the story echoes itself over and over again. There are two Catherines, two Heathcliffs, two houses (Thrushcross Grange and Wuthering Heights), two families (Earnshaw and Linton), two generations of characters, and even two halves to the novel. I found the names endlessly confusing, and on the advice from someone on instagram looked up a family tree. After shouting that the English should stop marrying their cousins, I did stop and think about the significance of all these pairs and of how interlinked all the elements of the story are. All these sets of pairs give the novel a claustrophobic feeling, and drive the tension in the inter-personal dramas. The only character to ever leave the limited setting of Grange and Heights dies ‘off screen’ once again adding to the possessive hold that novel has on physical space. I was also fascinated by how the second generation echoes the personality and failings of the first generation, which gave the novel a poetic feeling. As it just so perfectly illustrates the circular nature of the story and the excess of emotion that it contains. In terms of the excess of emotion, Heathcliff seems to be widely regarded as a classic example of the ‘tortured romantic hero’ archetype. I’m honestly not sure that I agree with that assessment, though I can appreciate that his twisted love is a particular form of romance, perhaps something we could call ‘gothic’ romance. He is fascinating as a character, being so deeply invested in long term revenge (even after the death of those who inflicted pain upon him), but I didn’t find him to be a romantic character. I am very glad I read this book. It is one that I have heard mentioned and referred to so many times, but I didn’t imagine that it was such a dark and complex book. The more I think about it the more clever this book appears to be. Emily Bronte might have only written one novel, but it is certainly a fascinating one. Suitable for readers aged 16 and up, but probably of more interest to older readers.